A company from Japan wants to become the first to advertise a product on the moon. 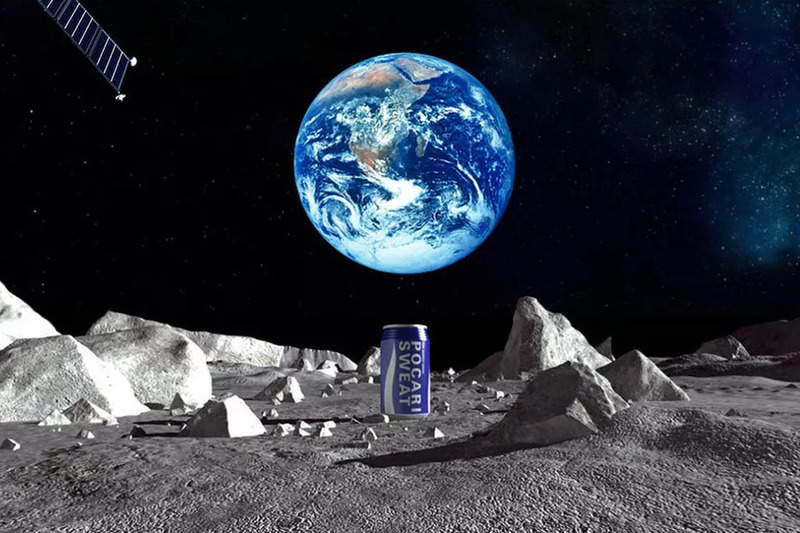 The sports drink producer, Pocari Sweat, has contacted SpaceX – an American company that regularly ferries cargo to the International Space Station and is close to sending astronauts to the International Space Station – to land a canned sports drink. This would mark a milestone in human history: the first ad on the moon – both disturbing and interesting at the same time. Maybe any kind of interest in moon exploration (who knows what happens when you try to land a can on the moon?) in this moment is welcomed. Maybe. SpaceX will land the rover which will ferry the canned drink to the moon and, of course, document the event sometime in the second half of 2016. According to Pocari Sweat, the ultimate goal is for a “modern-day child to someday become an astronaut and eventually drink its contents.” What a messed-up life goal that would be. Anyway, I guess whoever said that in the company had no idea what the can is going to contain. Instead of a liquid, the titanium can will hold a powder-like Kool Aid or Tang. Decades after becoming inspired by this milestone TV ad, a soon-to-be Japanese astronaut would have to mix the contents of the can with water. The can also doubles as a time capsule. Pocari Sweat will label the can with laser-etched messages from Asian children and members of the public. Possibly the biggest winner in this whole deal is Pittsburgh-based Astrobotic Technology, a company which will make both the lander and the rover which will carry the can once SpaceX’s Falcon 9 rocket has ignited its second-stage boosters. Astrobotic is on a race sponsored by Google for the Lunar X Prize. The first company that lands a contraption on the moon which can travel 500 meters and relay back an HD photograph will be awarded $20 million by Google. Getting signed by the sweat drink manufacturer must thus be the perfect opportunity. They’re basically getting financed to win on two projects. Good for them. Though I have mixed feelings about this – littering the moon to flash a corporate message seems a bit desperate in my book – it’s good to see the private space sector is begining to flourish. It can only get better.